An estate includes all property owned at the time of death and controlled by the deceased, such as life insurance proceeds and retirement funds. Real property held jointly with rights of survivorship is excluded from the estate because the property automatically passes to the joint holder outside of probate. To distribute assets, the estate must go through the probate process led by an executor, the estate’s overseer. Probate is the court-supervised collection of the estate’s assets by the executor, who distributes them to creditors and beneficiaries. It is the executor's duty to notify the estate’s creditors within 60 days of being appointed by the probate court. Notice to creditors of the debtor's death and commencement of probate proceedings must be published in a newspaper in the county where the probate proceedings are taking place. Creditors make their demands for payment directly to the executor, not the court, within three months after the final publication of this notice. They’re standing in line with their hands out, but which creditor should be paid first? Georgia law provides a system of priorities for payment. The highest priority claim against an estate’s assets is one year’s support for the family. This award is always paid before any creditors. The deceased’s funeral bills are second in line. After those payments come the expenses of administering the estate, such as court filing fees and newspaper ad costs. The next priority is to pay the deceased’s medical bills stemming from the last illness. Unpaid taxes are next in line, followed by secured loans and other liens. Last in priority are other debts, such as unsecured credit cards. You don’t have to be an accountant to determine the solvency of an estate. If the estate doesn’t have the means to pay its debts, it is considered insolvent. Simply add up the value of the assets and subtract the debts owed to creditors. If the latter amount is greater, the estate is deemed insolvent. It’s likely the executor will have to sell personal property and family heirlooms of the estate to raise as much cash as possible to pay creditors. If, after all assets are liquidated, there still isn’t enough money in the estate to cover a debt, it typically goes unpaid. Beneficiaries stand to get nothing, even if the will leaves them specific property or specific amounts of cash. 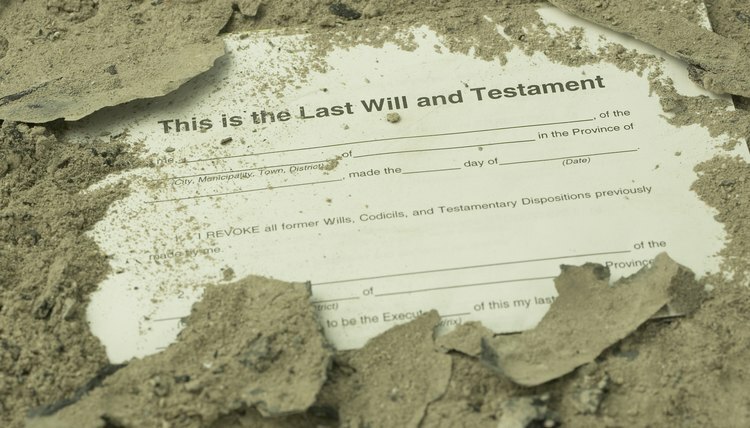 Durden & Mills, PC: Are the Heirs Responsible for the Deceased’s Debts? What Do I Do If My Father's Estate Doesn't Have Enough Money to Pay Taxes & Legal Fees?